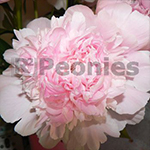 Alertie is a very early Peony with dark foliage and large flowers. The buds come with a pink glow and the flowers change in a couple of days to white pink. The fragrant flowers bloom in the early season. In Holland Alertie is one of the most popular newcomers of the last years. The Peony growers get paid well at the Dutch auctions. With the strong stems Alertie is beautiful in the garden or city parks. For ordering please contact one of us below.